We have held two very productive Dig Days in our Wildlife Area this term with many familiar and new families working hard to clear some of the bramble growth, clearing unwanted weeds from the pond, spreading bark chippings and preparing our new natural play area by the Junior playground. 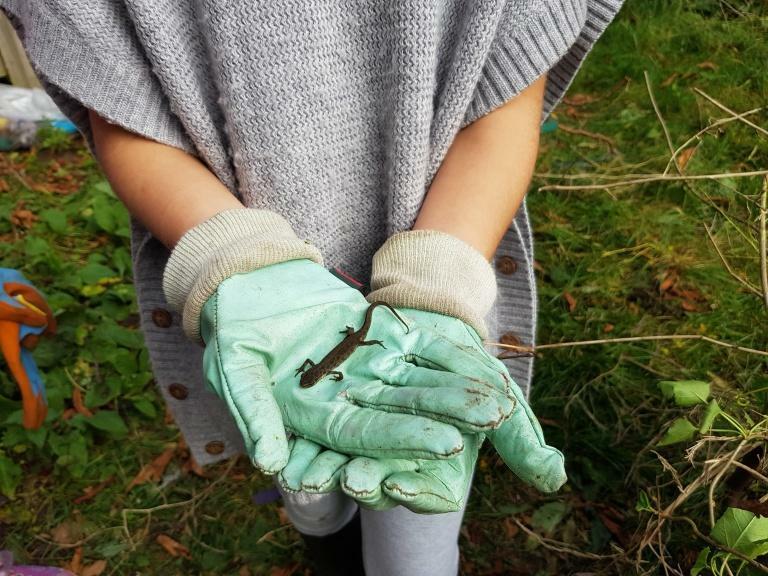 We have enjoyed seeing our Wildlife Area teeming with pond life, insects and little creatures and one of our Year 4 girls spotted this newt who was looking for somewhere to hibernate for the winter. Everyone always enjoys the tea, coffee and cake in our break and it is a wonderful opportunity for the children to spend time in this award-winning area outside school hours!